This introduction from the first version of this website, written in 1998, describes the origin of these Abba Hillel Silver web pages. How these pages came to be . . . Early on a Sunday morning in September 1954 I met a new friend (I'd come to Cleveland in June, just out of M.I.T., to work for Lincoln Electric). After breakfast at Clark's at Shaker Square we went to The Temple to hear Rabbi Abba Hillel Silver. So began a long relationship with The Temple. I attended services regularly and soon became a member. It is where I met my future bride, where we would marry in 1958 and where our daughters Susan, Margaret and Joanie became Bat Mitzvah and were confirmed. That was many years ago. Abba Hillel Silver died in 1963 at the age of 70, having served his congregation for 46 years. The center of activities for "The Temple - Tifereth Israel" moved east, following its members. But the magnificent old Temple in Cleveland's University Circle is still there, used for community meetings, the High Holy Days and life cycle events. One of those life cycle events was the wedding of my youngest daughter Joanie. 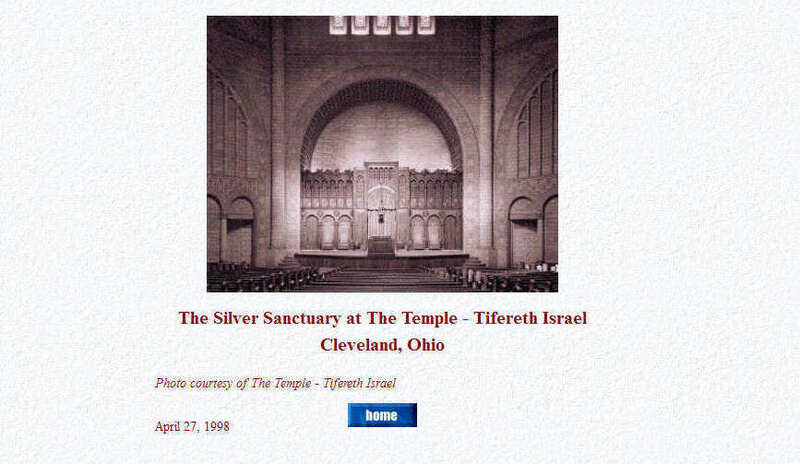 In April 1998, as part of a website I developed to celebrate the wedding, I created pages about the scene of the wedding, the Silver Sanctuary. Doing this brought back many memories of Abba Hillel Silver - perhaps the most eloquent, inspirational and accomplished man I had ever known. The wedding pages finished, I began to look for web-based information about Abba Hillel Silver. I visited almost every one of the nearly 200 "hits" revealed by search engines and my bookmark file grew. Then I created a small web page using a few of the more interesting links. The web page grew and became a small site. As The Temple-Tifereth Israel had no website in 1998, I added photos of the building where Abba Hillel Silver spent all but two years of his life as a rabbi. Last, as a personal note, I added some recollections, hoping that later others might furnish more. I hope you will find these pages interesting. The page that started it all is shown below, as it appeared on the Rob-Joanie wedding website in 1998. In those days of 56 Kbits/second dial-up modems, web designers used small images (this one is only 31 Kb) lest they get complaints about slow page loading. How fortunate that from this one page has grown a 400 plus page Cleveland Jewish History website.